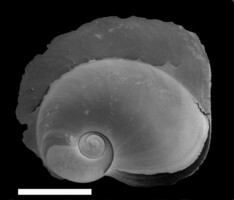 The maximal shell size of Atlanta lesueurii appears to vary geographically (from 2 mm in Hawaiian and eastern Australian waters to 6 mm in the tropical western Pacific). 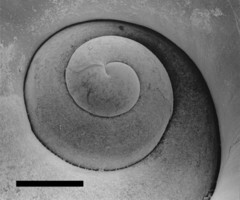 The shell is transparent, thin and fragile, with a smooth surface (lacking raised sculpture). 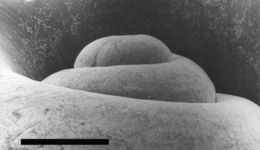 The spire is very small, somewhat elevated and compact, consisting of about 2-1/2 whorls. Spire sutures are deep, with the result that the whorls are somewhat rounded in profile and can easily be distinguished. 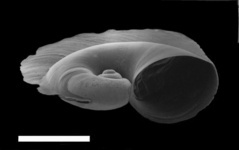 After metamorphosis the outermost whorl enlarges and inflates rapidly and the keel becomes progressively taller, becoming very tall in large adults and having a truncate leading edge. The keel base and spire sutures are colorless. Eyes type b, with a large lens. 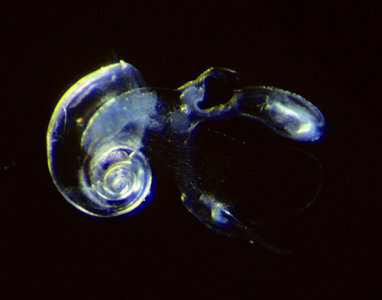 Operculum type b. Radula type I, with a narrowly triangular shape; largest in the genus Atlanta. Geographic distribution is cosmopolitan in tropical to subtropical waters. Vertical distribution in Hawaiian waters restricted to upper 150 m, with most individuals in the upper 100 m and some evidence for nocturnal migration into the upper 50 m.
Maximal shell size appears to vary geographically (=6 mm in the western tropical Pacific [Souleyet, 1852], 4 mm in the North Atlantic and Indian Oceans [Richter, 1986, 1974] and 2 mm off Hawaii [Seapy, 1990a,b] and eastern Australia [Newman, 1990]). 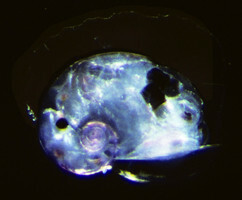 Diel vertical distribution patterns of Atlanta lesueurii (among the 13 species of heteropods in the study) were investigated off leeward Oahu, Hawaii in waters overlying a bottom depth of 2,000 (between 9 and 11 km offthe coast) by Seapy (1990b). heteropods were collected during day and night periods using paired, opening-closing BONGO nets at 50-m depth intervals between the surface and 200 m and at 200-300 m and 300-400 m. Three or four replicated tows were taken in each depth interval. A. lesueurii was found to be the most abundant species, with a maximal density of 59 individuals per 1,000 m3 in a daytime 0-45 m depth interval. at a station ). The species ranged from the surface to 140 m during both day and night periods. There was an apparent partial populational migration from a depth interval of 45-90 m during the day to 0-45 m at night. However, high variability in densities between the replicated tows in each of the depth intervals resulted in statistically non-significant differences between day and night periods for each of the depth intervals. In a subsequent study off leeward Oahu (Seapy, 2008), duplicate tows were taken with a MOCNESS mutiple, opening-closing net system during day and night periods at three stations located 1, 5 and 15 nm off the island in fall and spring sampling periods. Mean densities were computed (as numbers of individuals beneath 100 m2 of ocean surface) during day and night periods at each station. As in the 1990b study, A. lesueurii was the most abundant species in the fall, although it was a close second to A. plana in the spring. Comparisons were made using the nighttime density data to avoid issues such as daytime net avoidance and to include increased nighttime abundances resulting from possible nocturnal vertical migrator species. 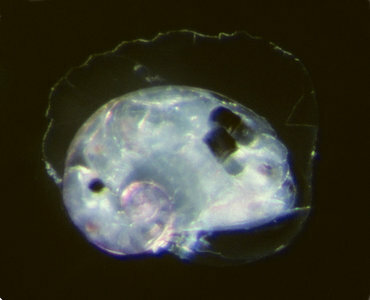 A. lesueurii was found to be most abundant at the offshore (15 nm) station during both seasons. Offshore to inshore abundance decreased most dramatically in the fall; from mean nighttime densities of 480 (15 nm) to 124 (5 nm) to 37 (1 nm) individuals beneath 100 m2 of ocean surface. At the 15 nm station the species ranged downward to the greatest depths; to the 120-160 m depth interval in the spring and to the 80-120 m depth interval in the fall. Clear evidence for nocturnal vertical migration was only seen in the spring at the 1-nm station (10-m depth intervai tows were taken in the upper 100 m at this shallow-water station). Highest abundances were recorded between 60 and 30 m during the day to 30 m to the surface at night. Newman, L. J. 1990. The heteropod fauna (Prosobranchia, Heteropoda) of Australian and Papua New Guinean waters: a taxonomic and distributional review. Ph.D. thesis, University of Queensland, Australia. Richter, G. 1986. Zur Kenntnis der Gattung Atlanta (II). Atlanta lesueuri Souleyet und Atlanta oligogyra Tesch (Prosobranchia: Heteropoda). Archiv f?r Mollusken-kunde 117: 19-31. Souleyet, [L. F. A.]. In: Eydoux, [F.] and Souleyet [L. F. A. ], 1852. Voyage autour du monde execute pendant les annees 1836 et 1837 sur la corvette 'La Bonite'... Zoologie, col. 2. 664 pp. A. Bertrand, Paris.